A totally re-designed ice bag with one flocked side to allow bag to be applied directly to body surface. The flocking material is designed to control sweating as well as eliminate ice burns. Also designed as a single patient item which may be re-used and sent home with the patient. Wide opening for ease in filling and vinyl backsplash to prevent leaking and wicking. A shoestring type tie is included with each bag to hold bag in place, if desired. Packaged 25 bags to a dispenser carton. 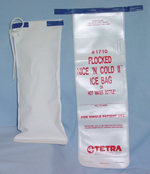 To compliment our line of hot and cold therapy items, these bags are designed as an economical approach to the rubber ice bags which generally are three to four times more expensive. They are a single patient use item. The materials used in construction are white flocked vinyl on the surface that touches the body, white taffeta embossed vinyl on the top portion with a Halkey-Roberts valve. The positive seal of the seams and valve provides a leak proof unit. The vinyls used can withstand a zero degree cold and can also be used with hot water for heat therapy uses. All bags are individually poly wrapped and packed 12 bags per carton. All TETRA 1731 chemical packs contain ingredients that are non-toxic and non-caustic, eliminating the possibility of patient injury and are designed for single patient use. The packs are still manufactured by hand so we can incorporate the water bag at the top for easy activation. Insulated sides make it possible to place product directly on the skin. Periodic re-shaking of TETRA’s INSTA-COLD® and INSTA-HOT® products will prolong the original cold/heat. 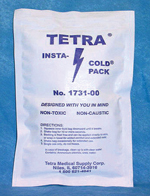 TETRA cold packs use Urea and Ammonium Chloride to achieve a more effective cold therapy session. The use of cold treatment or cryo therapy for injuries has been medically recognized as beneficial for years. The application of cold produces an anesthetic effect, relieving aches and pains. Tetra Insta-Cold is a convenient way to handle cold compress therapy. Non-toxic and non-caustic ingredients. Tetra's new and improved insulated outer bags on the standard size Insta-Hot and Insta-Colds utilize a special non-woven material that enhances the therapy time and greatly diminishes the extreme hot or cold spikes that you experience with other clear plastic outer bags.